Peace Out Electric Run! My Pants are Rad!! Another pair of leggings? Can a girl have too many? Well, yes. But I haven't reached that point yet. For version 4, I modified the Sewing Cake Espresso Leggings even further than my previous 3 versions. In addition to all my mods, I added a cuff which is split at the calf. And, I made them out of pop out of your eye socket tie-dye peace signs that I picked up from Billies' Designer Fabrics. This is my real "race" for the spring race challenge. We signed up in like, May or earlier. But alas, it is late summer and spring is long over. This is a HUGE deal. 10 years ago, peace signs are something I swore up and down I'd never have, wear, or look at. Oh gawd those things are ugly. I was part of a 15 or so artist project called "The Box Project". We used take out box shapes, swapped them with each artist and embellished them using a theme set by the box owner. My theme was the olive branch of peace. It was a time in my life when I felt totally unsettled, bereft, and deeply in need of a calm, peaceful center which I could not find anywhere inside or out. Well, when my Aunties who were participating artists and all former hippies (I say that with affection mind) heard peace and remembered how well I could handle being teased (dripping with sarcasm because I couldn't take a joke then), they all said they were going to adorn my box in peace signs and began singing songs from Woodstock and such. "I DON'T WANT ANY GAWDY PEACE SIGNS ON MY BOX!!! NO GAWDY PEACE SIGNS YOU GUYS!!!!!!!!" Well, that practically sealed the deal. Peace signs it was. Oh lord. Excuse me while I wretch Aunties! And now look at me! I'm freakin happy in these pants and I looked normal among all the other Electric Run participants in Tutu's, glowing wings, crazy socks and other adornment. They make me smile and I don't care a snit what anyone else thinks. In fact, I recently wore them on an "athletic date". If he can't handle me in these pants, he won't be able to handle my colorful personality. Gratefully, they did their job. And the Electric Run? Well, that was a hoot! My friend & I ran about in the dark, acted silly, took loads of photos and giggled like school girls. It was a little strange to run through the Barns at the Fair still wafting smells of the animals which normally hang out there. But, the giant gummy bear, everyone's wacky costumes, the sunset, and the full moon were totally worth it. And then there was dancing after! FUN! Pre and post run, however, I rested. Lots. The past 2 weekends I've I hiked 13-15 miles in a single trip plus walking 10-20 miles during the week. I was still exhausted from all that this weekend. 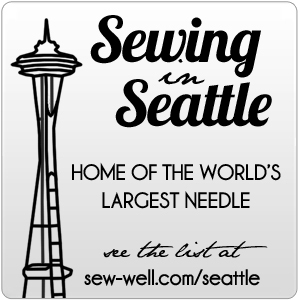 That meant I missed Sew Well's meet up. It looks like they had a lovely time! Soon ladies. Soon, we must sew & chat together. So, are you game to be a Rockstar in the Night and hug a giant gummy bear? Shall we make wacky leggings and meet up at the Electric Run in 2015? I'm game if you are!!!!!! Recently, I've beensewing leggings, repeatedly. Not just 1. Not 2. But I'm already at my 3rd pair. My mom's always told me to make something over and over again, but I fear boredom. Considering that I have fun & unique fabric for each pair of leggings, I'm not bored. What I find fascinating is how with each iteration, I'm improving the pattern. And by making the same thing, I can improve my efficiency in construction, and it also allows my creative mind to dream up alternate waistbands, finishing, etc. I'm also participating in the Spring Race Challenge. Sew active wear. Run a race. Leggings are a critical part of my activewear wardrobe. Be it yoga, walking, hiking, skating or otherwise, I want fitted pants with complete freedom and my full range of movement. I do not like to be restricted. I want the perfect me-fit legging and am discovering that getting the crotch curve and inner thigh fit is a bit of a challenge. I got this 3rd version of the espresso leggings just about right. But I still have several inches to take out. I'm very short waisted, but very curvy. Even Kathy Ruddy was shocked at the front vs. back crotch depths when she measured me for a custom pant pattern. "Ok, whew. I'm not crazy." I thought hearing it from someone who had sewed & drafted patterns longer than me. This time, however, I opted for covering the elastic in fabric first, then attaching to the waistband. It allowed me to cut off ~ 6" of excess and get the waist lower than my ribs and closer to my belly button. Whew! I love it. I learned the technique in a Threads magazine years ago. Must find that edition and share. I also made this pair capris. I stood, used my measuring tape and self-measured from floor up to the point on my calves where I wanted the capris to hit. Not the most accurate, but a decent way to start. I was going to use fold over elastic instead of hemming. I stitched it on the back first, then tried on the pants. I liked the 1/4 " of contrasting red elastic hanging below the edge (instead of folded over) so much that I just left them. I tried to find a race. I really did. I researched, I talked with friends, I invited people. But, Every time I'd go to sign up, I'd check my schedule and there'd be another commitment. Combine that with another competing commitment - spending money a race vs. doing something for free. Free always won out at present. I like the idea of races, but the entry fees, even with a "free shirt" are not enticing me. Ok, paying attention to that, I don't really want to race. So, I decided that I just needed to race myself. That's still a race. Beat your own time, try a new technique, endure a longer time. Now that's something I can get behind. On a sunny day, I grabbed my new capris and raced outside to skate as long as I could. Mind you, I'm always goofing a little on my skates - I dance, balance, swivel and push myself beyond the envelope. You can imagine that I really stand out. Not only because I look like Florida in the grey, soft, Northwest light, but also because I dance on skates. I often see people smile. I feel happy. It's a win. I'm still a little nervous in public wearing these pants as there are very bold. But it's a great exercise in being me! Here the capris are in action. They were very comfortable. I skated ~ 8 miles. That's about 2 more than I normally do. Yay me! I even fell a little on a weird bit of grooved sidewalk. Thank God I wore my wrist guards and knee pads (which are in desperate need of replacement since the elastic is worn out. They're 14 years old!). Pants survived sans damage. Whoop, whoop!